Hello and welcome to Week 3 of the One Room Challenge! If you’re looking for weeks 1 and 2 posts, you won’t really find them since I’m jumping into the ORC half-way through. Heck, I don’t need 6 weeks – it’s a small room, haha. Week 1: would be considered my ‘design inspiration’ phase and you can see that here. Week 2: I made a couple of purchases, like the wallpaper and created the wainscoting design layout on the computer – essentially a blueprint to follow. In today’s post I am going to show you what I did this week as well as tell you about the lighting change I made. After spotting the nursery reveal by Oksana of Foxie Oxie, I immediately fell in love with the wallpaper mural she had chosen. It was at this very moment that I decided I had to have this for my small powder bathroom. 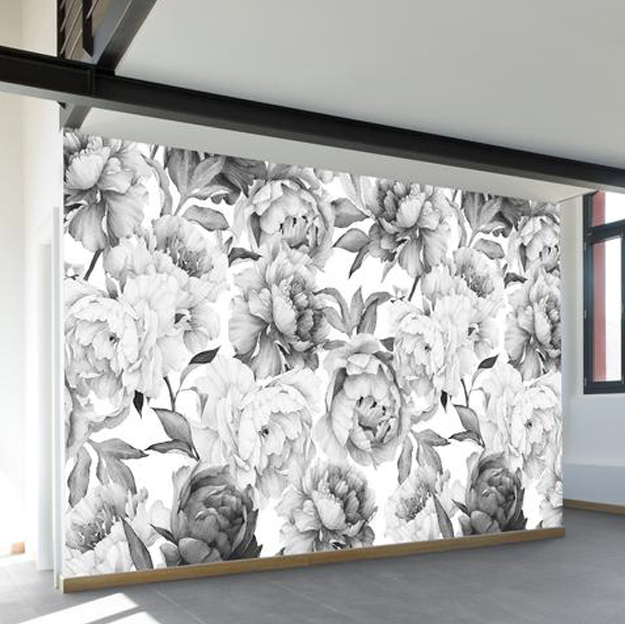 This wall mural, called Clara Wall Mural, by Walls Need Love is a removable, adhesive wallpaper. 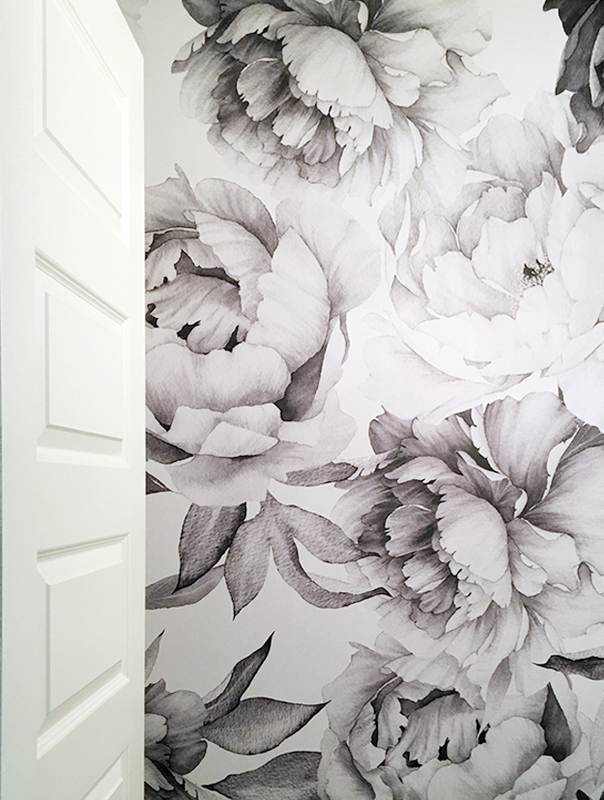 Note: if you are renting or not sure you’ll like having wallpaper a few years from now, this is a great option for you too! The hubs and I designed and built our home about 1 ½ years ago. My design style is transitional – a mix of modern and traditional elements. You could also say my home is minimalistic and neutral in nature, but I love adding a few dramatic elements – like a gathering kitchen table (it’s much longer than the standard kitchen table length), two cobalt blue sofas, and now this wall mural as you step into the entryway and catch a glimpse through the cracked powder room door. I spent several days, actually more like two weeks, searching and deciding on the light fixture to go above the mirror. I decided on what I wanted right away, but the price had me hesitating. If you don’t know this about me, I’m going to let you in on a little secret, I’m frugal. The hubs likes to say cheap, but I think there’s a big difference between cheap and frugal. Anyways, I didn’t want to pay $130 for one light fixture. So after plenty of researching I finally found THE ONE! The one that looked like my original concept, but at a much better price of $50. 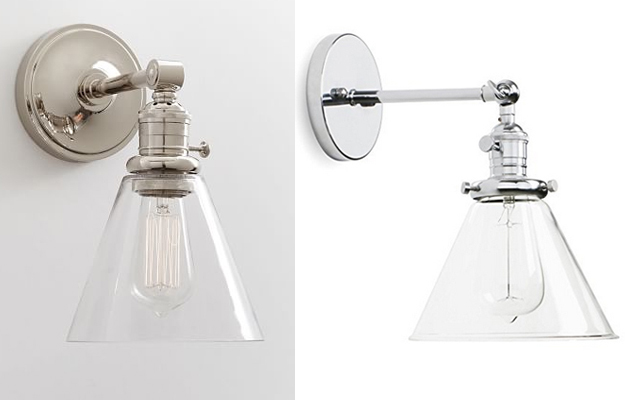 The one on the left was the clear glass flared sconce light I almost bought from Pottery Barn, and on the right is the one I bought. Next week I’ll have the wainscoting completed – the paneling that lines the lower part of the wall. And a few of the ‘detail’ items I ordered should arrive. See ya next week! Oh my heart!! That wallpaper!!! It’s beyond. So in love. We’ll be excited to see the reveal! Get out! It’s a peel and stick too?! That is my love language!! I know, right?! You’ll have to come see it in person. Love that you’re diving right into this project on Week 3! And, you’re right – you’re almost finished!! WOW! 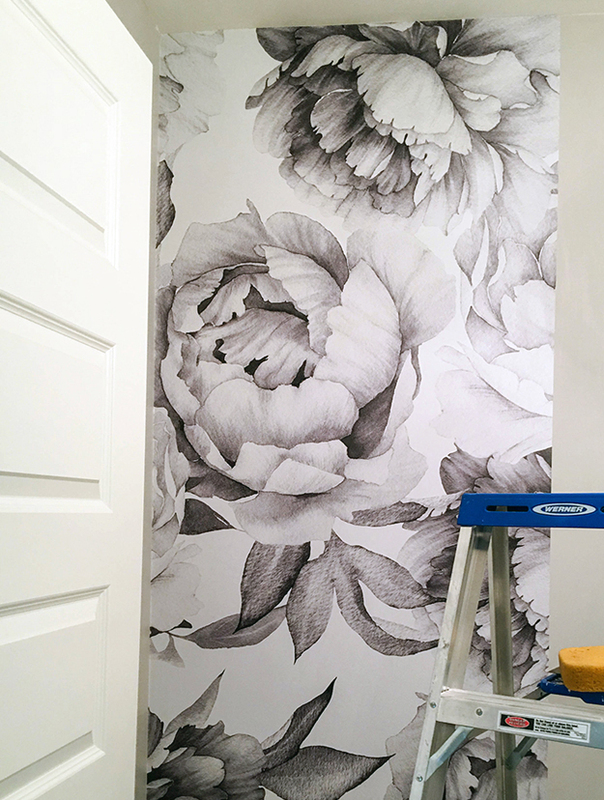 The wallpaper will make a fantastic impact in this tiny space! I’m a ‘get it done’ kind of girl! haha. Thanks for visiting! This looks absolutely wonderful! I love the wall paper you’ve chosen. Welcome to the challenge! I’ll be wallpapering too. A bit nervous, but ready for it just the same.